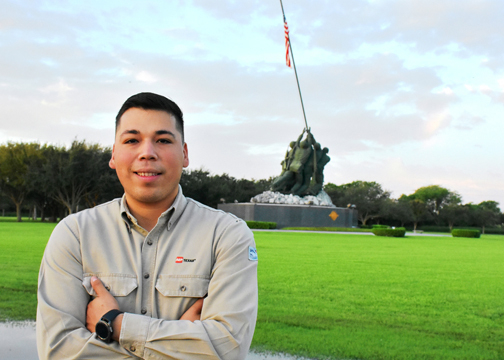 (HARLINGEN) – Arturo Veloz came to the United States when he was 7-years-old, with only hopes and dreams, but thanks to Texas State Technical College, he is now celebrating his recent citizenship to the country he loves so much and living the American Dream. Born in Rio Bravo, Mexico, the 26-year-old started second grade in Weslaco and lived with his uncle. His parents and two younger sisters stayed behind in Mexico. “The first thing I remember seeing when I came to the United States was Texas Street in Weslaco. I was amazed. To me, I was in the big city,” said Veloz. “My parents always told me about the types of opportunity I would find here and that day, although scared, I was inspired. But what sold me on staying was Whataburger, it was my first time eating one and wow,” he added with a laugh. Veloz learned English within the first year of arriving in the U.S., after a language barrier incident made him the center of ridicule in his class. For Veloz, college seemed a far-fetched idea. He expected to return to Mexico after high school to follow his father’s footsteps in healthcare, but when his father suddenly passed, plans changed for Veloz. “I was able to get a VISA to study and to work, and my mother, who joined me with my sisters, helped me start the college process,” he said. Veloz started his college career at a local community college pursuing healthcare. He eventually graduated as a certified nursing assistant and worked for a short time at a nursing home. He wanted to honor his father, who was a forensic and criminology doctor in Mexico, but said he knew deep down the medical field was not for him. It was a visit to an instructor from the University of Texas Rio Grande Valley that shaped his future. “He told me all about TSTC and the programs it offers and how he believed it was a right fit for me, and he was right,” said Veloz. It was Summer 2013 when Veloz earned his associate degree in Biomedical Equipment Technology from TSTC and immediately gained employment with General Electric in Houston as a biomedical technician. After spending one year at General Electric, Veloz moved back to the RGV to witness the birth of his daughter, marry his long-time girlfriend and work as a biomedical technician, this time for Doctors Hospital at Renaissance for another three years. Veloz is a Meter Electrician with American Electric Power and he said it was the best move he could have made. 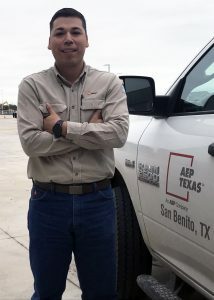 Genaro Marquez, AEP meter electrician supervisor and TSTC alumnus, had nothing but positive praise for Veloz. And what makes Veloz’s success even sweeter, is that his 10-year path to citizenship finally paid off. He officially became a U.S. citizen last month. Biomedical Equipment Technology is offered at TSTC’s Harlingen and Waco campuses. For more information on Biomedical Equipment Technology, visit tstc.edu/programs/BiomedicalEquipmetTechnology.